How should I wash my tin-plated item? To extend the life of your tin-plated items and get the best performance possible, make sure to hand wash them only. Avoid using abrasive cleaning materials and strong detergents. Gentle dish soap and warm water will give the best results. Rinse your items thoroughly and dry them completely before storing them in a dry location. 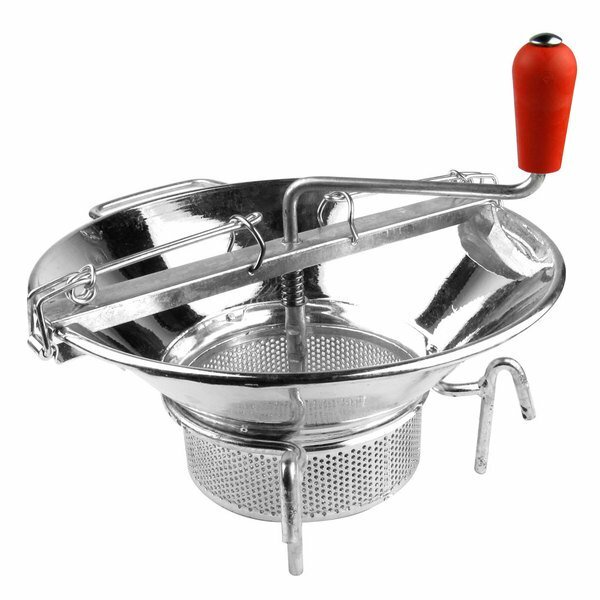 This Tellier M5 14" diameter tin-plated #5 food mill has a double milling system on the bottom and sides to easily puree and mill tomatoes, apples, carrots, potatoes, fruit sauces, soups and much more. Simply place the cooked fruits or vegetables in the mill and turn the crank! The semicircular blade sweeps, compresses, and scrapes the food, while the bar applies constant pressure against the cutting plate while retaining seeds, skin, and fibers. 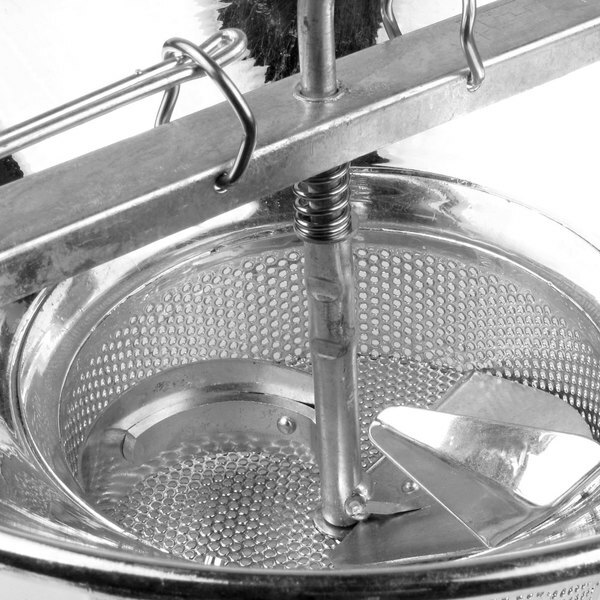 For smooth foods like fruit sauces and tomato juice, the 1mm or 1.5mm sieve work best. 2mm and 3mm sieves are great for creating purees and soups, and 4mm sieves are an ideal selection when using vegetables, root crops, cooked lettuce, and similar foods. This tin-plated mill comes with a sieve and has an output of approximately 10 lb. per minute thanks to its basket sieve cutting plate design. And to ensure you can produce food in large quantities, this food mill has a large 8 qt. capacity. I am only speaking to those people out there that know what this is used for and have used them in the past. Alright you know what this is and you need one. This is the one too get. The size is large and the quality is excellent. What else could you want? You will need a pot to rest it on when you are ready to strain your Tomatoes and that is it. Remember that this large. That is a good thing. I have another one I purchased. I believe it is OXO Grip?? That is way too small to be useful. This one a bigger and much more useful for straining large amounts of Tomatoes etc. Good Luck.. Very nice european food mill. Very easy to assemble and the handle glides without much if any resistance. This is definitely built to last a very long time. the Food Mill saved me so much time making a large batch of our famous Gnocchi. easy to store and clean I highly recommend it. We like to pipe our mashed potatoes elegantly onto the plate and the Tin-Plated food mill whips them up nice and smooth without turning them into paste.